Sweets are the biggest hit during any Eid celebration. It is not ‘Eid until you have sweets and desserts on the table. In fact, every house we visit during Eid, will have delectable sweets/desserts served to their guests. It is definitely a day to celebrate the long days of fasting in Ramadan and indulge that sweet tooth a bit, if you so choose. 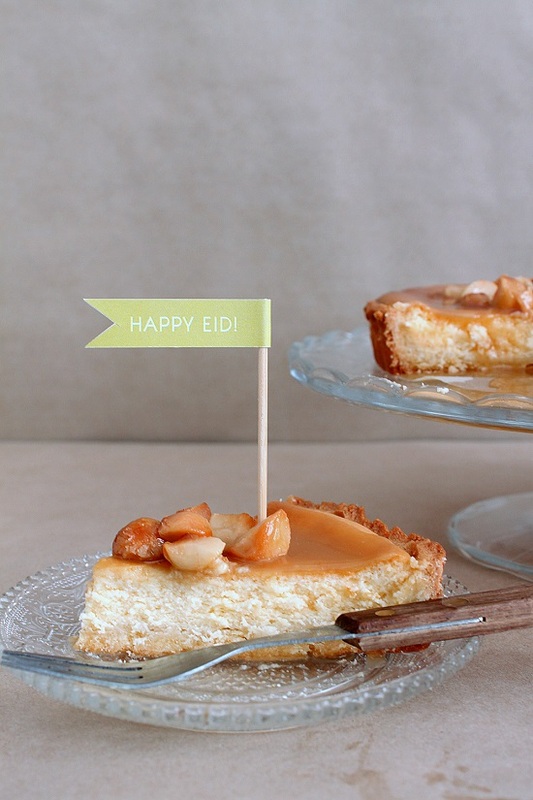 Iva Izman of In My Studio shares with us her recipe for Salted Caramel Macadamia Cheesecake and her free Eid printables you can download to decorate this dessert or any others you’ll display on Eid- they’re absolutely adorable. I know Eid is still a few weeks away, but I couldn’t help myself from looking at tasty cakes on Pinterest just to get an idea. The thought ‘what shall I make this Eid?’ was lingering in my mind, but it wasn’t until I created my annual FREE DIY Printables that I knew exactly what type of cake I wanted to make to complement my party decor. I wanted more of a neutral color cake but most importantly, a cake that simply bursts with flavor. The winner? 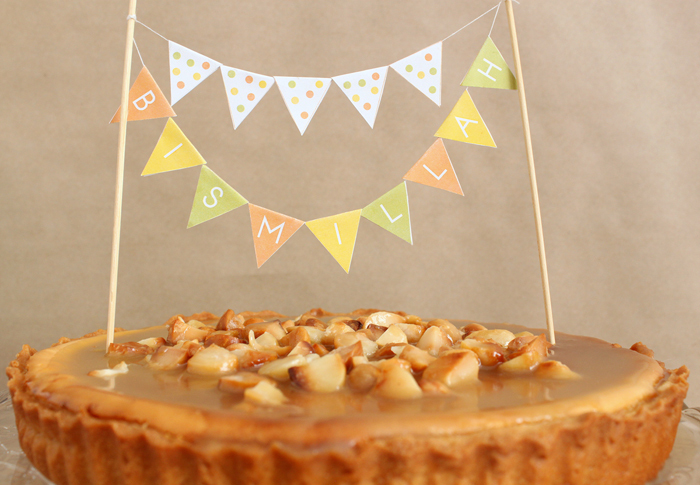 This Salted Caramel Macadamia Cheesecake- a cake that not only children can enjoy, adults, too. Now who’s drooling? 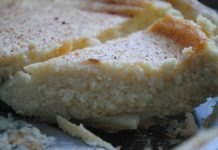 Cheesecake mix: 500g (18 ounces) Philadelphia cream cheese 150g (1/2 cup + 1/4 cup) caster sugar 1 teaspoon vanilla essence 2 teaspoons lemon juice 3 eggs 100 grams (3.5 ounces) sour cream Method for Cheesecake mix: 1. In a mixer, whisk cream cheese, sour cream and caster sugar until well combined. 2. Add eggs one at a time and then vanilla essence and lemon juice. 3. 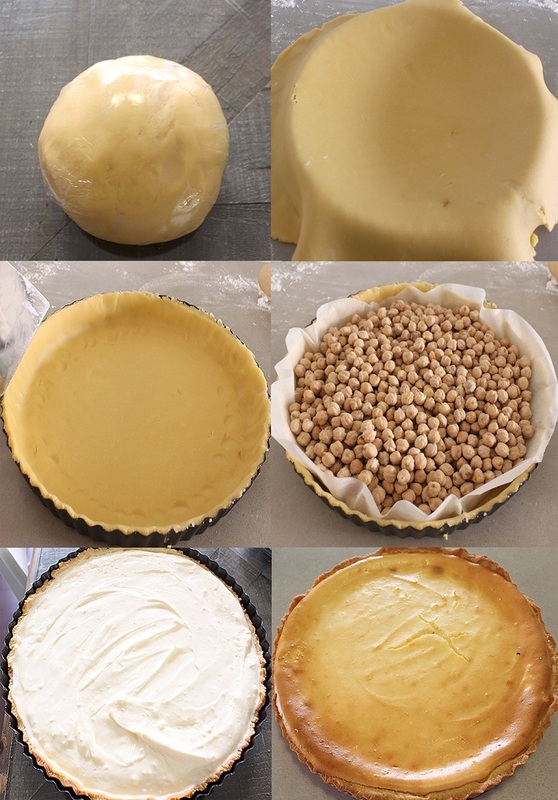 Pour the cake mixture into the baked tart, and then into the heated oven at 160 degrees for 50 minutes. 4. Leave to cool before putting the salted caramel topping. Salted Caramel Sauce: 150g (1/2 cup + 1/4 cup) caster sugar 150g (1/2 cup) brown sugar 50ml (3 + 1/3 tablespoons) water 3g (1/2 teaspoon) salt 100g (1/3 cup) butter 120g (1/2 cup) cream 120g (1/2 cup) macadamia (roasted and chopped roughly) Method for Salted Caramel Sauce: 1. Boil 50ml (3 + 1/3 tablespoons) of water, caster sugar and salt to make a caramel. 2. Add the cream, brown sugar and butter and cook until the sugar is melted. 3. Allow to cool and become thick before spreading on top of cooled cake. 4. Pour 3/4 of sauce on top of cooled cake and then add the chopped macadamias, then pour the rest of the sauce evenly to coat macadamias. Decorations: These were decorated with my FREE DIY Eid Printables in the Confetti Collection, available to download from www.inmystudio.com.au. 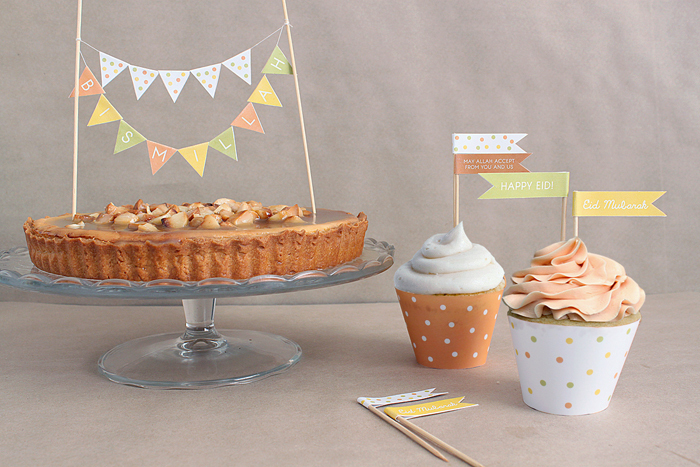 I have released a free printable each week in Ramadan, so do check the site to see what I have, for example you might like my lantern design or my ‘Sweets’ week with cake flags, cupcake wrappers and toppers (as seen in pictures). 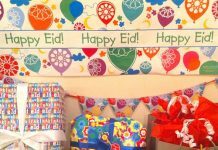 Don’t leave your Eid preparations till the last minute, these printables can easily be made ahead and stored. As a mother, I know how hectic a few days before Eid can be. Mountains of present shopping/wrapping, baking, cooking, cleaning, decorating etc…everything hits us all at once! So save yourself the heartache and rushing around, and prepare your Eid decorations in advance. I wish you all a blessed Ramadan. May this one be your best one yet, inshallah. In 2008, Iva graduated with a Bachelors Degree in Interior Design (with honors) at RMIT Melbourne. Soon after her first daughter was born in 2010, she founded her design firm, In My Studio, where she does interior and stationery design. Now with 2 kids and another on the way, she is a busy work-at-home-mum, balancing her days between family, work and social commitments. Iva prides herself in her attention to detail and her love of color. 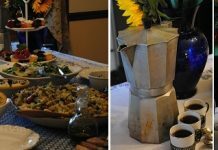 She combines her creativity and practical skills with an educational background that has taught her to think philosophically and conceptually, enabling her to essentially heighten the essence of her work. Sounds delicious. And the printables are so cute! It’s a wonderful Eid party idea. Thanks for sharing. I do know ” RAMADAN ” …..What is ” EID ” ? It sounds like a ” Sweet Celebration ” !! Hello! I just wanted to ask iff you everr have any issues with hackers? ended upp losing many months off hard work duue to no backup. wish to say that this write-up very compelled me to take a look at and do so! Paragraph writing is also a excitement, if you be familiar with afterward you can write if not it is complex to write. in the United States, causing a whole new level of awareness for cartoons in general. That means your cable operator is not providing you with sufficient channels and your child is also devoid of some of the must popular cartoon channels. And the enjoyment value, we all know precisely how successful the Simpsons and Loved ones Guy can be. 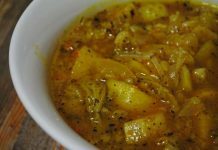 ASA, i am à non-Muslim, seeking for recipe for my husband, because where we live is so so dificult to find food for him To eat when you stay in à country where mostly everthing consider with pork. So i have discover this site that is well convient with help for him serve his creator Allah.